The information marketing platform. "The voice of the Ebro"
I’ve been to Spain many times before but I’d never visited Tortosa, in fact before I met Rosie Reay playing Scrabble online I’d never even heard of it! Looked in the normal tourist guides and apart from a line or two it wasn’t mentioned. I was intrigued. As we’d arrived late to the Corona hotel we decided to stay put and then explore the next day. After a wonderful breakfast, ‘twas a revelation to see the workmen drinking beer at 8am, on went the sunglasses and sun cream. We’re not the type of people to plan our adventures so it was out the door and turn left! We weren’t disappointed. 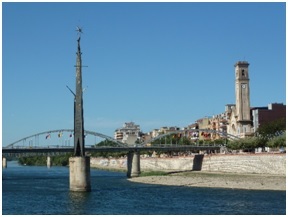 Nestled on the banks of the Ebro it really is a city of two halves. On the right bank where we were staying it had a much more urban feel, the place where people lived, they worked, they spent time with their families. But a gentle stroll across the bridge and you were in the ‘old town’. A vibrant, busy place, full of character, architecture, shops, places to eat and more importantly ‘be seen’. Whether drinking coffee, enjoying a beer or nibbling tapas, the locals really seemed to be enjoying the town. It had a relaxed, informal, atmosphere. Although not ‘touristy’ it felt comfortable. It didn’t matter we knew no Catalan, a friendly smile goes a long way. Everyone made us feel welcome. The old half is just that – old! The Cathedral of Santa Maria de Tortosa is a great place to visit. We learned a lot about the history of the city, it really has been around a long time. The streets are steeped in history and it was quite exciting to think that we may have walked the same steps as the Romans! Unless you want a big debate don’t mention the impressive monument in the middle of the river, it really is the elephant in the room.